"Powerful Proposals" gives businesses proven strategies for creating customer-centered documents that outshine the competition every time. 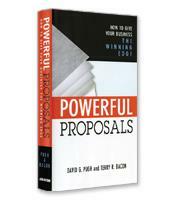 "Powerful Proposals" goes beyond "This is what we do" documents and takes the reader step by step through designing sales-focused, individual proposals that highlight the firm's tangible benefits to the client. 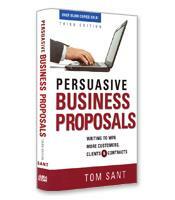 How to assess a proposal’s “winner or loser” status and take proactive steps to become a winner. Techniques to address the “Big Four” questions that a proposal must answer to be successful. How to neutralize the issue of price when the firm is not the low-price provider.